The meridian 7° east of Greenwich is a line of longitude that extends from the North Pole across the Arctic Ocean, Europe, Africa, the Atlantic Ocean, the Southern Ocean, and Antarctica to the South Pole. 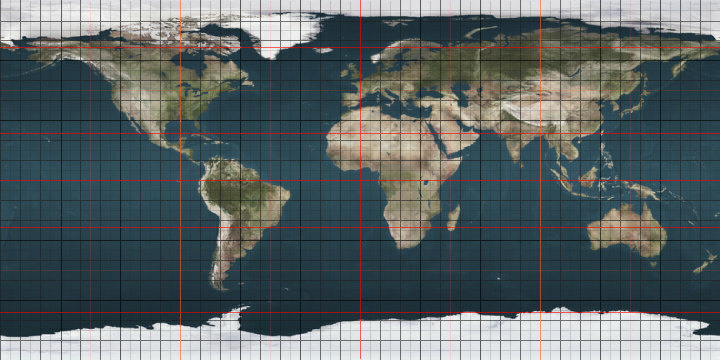 The 7th meridian east forms a great circle with the 173rd meridian west. Entering at Fræna in Møre og Romsdal. Exiting 3 km west of Lindesnes in Vest-Agder. The meridian 90° east of Greenwich is a line of longitude that extends from the North Pole across the Arctic Ocean, Asia, the Indian Ocean, the Southern Ocean, and Antarctica to the South Pole. The meridian 10° east of Greenwich is a line of longitude that extends from the North Pole across the Arctic Ocean, Europe, Africa, the Atlantic Ocean, the Southern Ocean, and Antarctica to the South Pole. The meridian 50° east of Greenwich is a line of longitude that extends from the North Pole across the Arctic Ocean, Europe, Asia, Africa, the Indian Ocean, Madagascar, the Southern Ocean, and Antarctica to the South Pole. The meridian 120° east of Greenwich is a line of longitude that extends from the North Pole across the Arctic Ocean, Asia, the Indian Ocean, Australia, the Southern Ocean, and Antarctica to the South Pole. The meridian 140° east of Greenwich is a line of longitude that extends from the North Pole across the Arctic Ocean, Asia, the Pacific Ocean, Australasia, the Indian Ocean, the Southern Ocean, and Antarctica to the South Pole. The meridian 160° east of Greenwich is a line of longitude that extends from the North Pole across the Arctic Ocean, Asia, the Pacific Ocean, the Southern Ocean, and Antarctica to the South Pole. The meridian 170° east of Greenwich is a line of longitude that extends from the North Pole across the Arctic Ocean, Asia, the Pacific Ocean, New Zealand, the Southern Ocean, and Antarctica to the South Pole. The meridian 45° east of Greenwich is a line of longitude that extends from the North Pole across the Arctic Ocean, Europe, Asia, Africa, the Indian Ocean, the Southern Ocean, and Antarctica to the South Pole. The meridian 35° east of Greenwich is a line of longitude that extends from the North Pole across the Arctic Ocean, Europe, Asia, Africa, the Indian Ocean, the Southern Ocean, and Antarctica to the South Pole. The meridian 55° east of Greenwich is a line of longitude that extends from the North Pole across the Arctic Ocean, Europe, Asia, the Indian Ocean, the Southern Ocean, and Antarctica to the South Pole. The meridian 65° east of Greenwich is a line of longitude that extends from the North Pole across the Arctic Ocean, Europe, Asia, the Indian Ocean, the Southern Ocean, and Antarctica to the South Pole. The meridian 75° east of Greenwich is a line of longitude that extends from the North Pole across the Arctic Ocean, Asia, the Indian Ocean, the Southern Ocean, and Antarctica to the South Pole. The meridian 85° east of Greenwich is a line of longitude that extends from the North Pole across the Arctic Ocean, Asia, the Indian Ocean, the Southern Ocean, and Antarctica to the South Pole. The meridian 115° east of Greenwich is a line of longitude that extends from the North Pole across the Arctic Ocean, Asia, the Indian Ocean, Australasia, the Southern Ocean, and Antarctica to the South Pole. The meridian 125° east of Greenwich is a line of longitude that extends from the North Pole across the Arctic Ocean, Asia, Australia, the Indian Ocean, the Southern Ocean, and Antarctica to the South Pole. The meridian 155° east of Greenwich is a line of longitude that extends from the North Pole across the Arctic Ocean, Asia, the Pacific Ocean, Australasia, the Southern Ocean, and Antarctica to the South Pole. The meridian 165° east of Greenwich is a line of longitude that extends from the North Pole across the Arctic Ocean, Asia, the Pacific Ocean, the Southern Ocean, and Antarctica to the South Pole. The meridian 175° east of Greenwich is a line of longitude that extends from the North Pole across the Arctic Ocean, Asia, the Pacific Ocean, New Zealand, the Southern Ocean, and Antarctica to the South Pole. The meridian 145° east of Greenwich is a line of longitude that extends from the North Pole across the Arctic Ocean, Asia, the Pacific Ocean, Australasia, the Indian Ocean, the Southern Ocean, and Antarctica to the South Pole.